This dogma is quite erroneous, and it can be refuted effectively. In response I must first point out that it is generally agreed that whatever the baptism is — in those passages that associate the rite with salvation — it is the same type of baptism in all the verses. In other words, the baptism of Matthew 28:19 is of the same kind as that in Acts 2:38, 22:16; Romans 6:3-4; 1 Corinthians 12:13; Galatians 3:27; Colossians 2:12; 1 Peter 3:21; etc. My debate opponent, mentioned above, happily conceded this point. The baptism mentioned in Matthew 28:19 had human administrators. Christ commissioned the apostles to go and make disciples, baptizing them into the name of the Father, Son, and Holy Spirit. Inasmuch as an apostle could not baptize “in the Spirit” (only Christ could do that — Mt. 3:11), one is forced to conclude that the baptism of Matthew 28:19 is water baptism, not Spirit baptism. I am unaware of any reputable Bible scholar who contends otherwise. 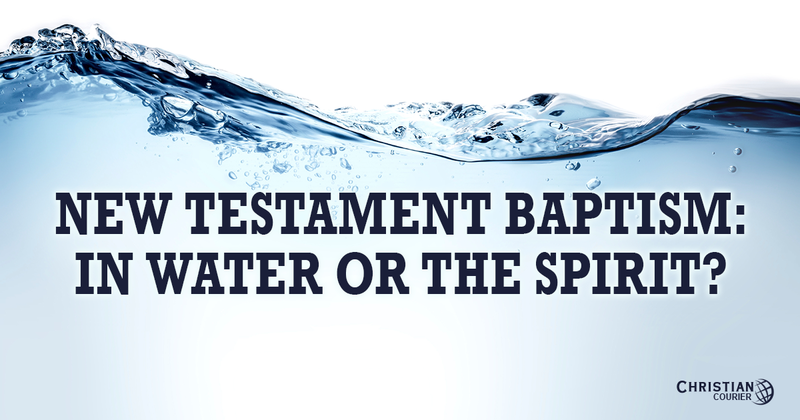 If, then, the other passages that mention baptism (see above) are of the same import, it follows that they likewise refer to water baptism, not Spirit baptism. Both Romans 6:3-4 and Colossians 2:12 make it clear that the baptism of these passages involves both an immersion in something, and a being raised from the same substance. This makes perfectly good sense if water baptism is in view. On the other hand, if the Spirit is the element of the baptism, this would suggest that one is buried in the Spirit, and subsequently raised from the Spirit. This would imply further that the new convert would not have the Spirit, and therefore, would not belong to the Lord (Rom. 8:9; Gal. 4:6). This conclusion obviously is wrong — thus demonstrating that the element of the baptism in Romans 6:3-4 and Colossians 2:12 is not the Holy Spirit. By default, it must be water baptism. Water is specifically associated with baptism in 1 Peter 3:20-21. If the allusion here, then, is to water baptism, and yet 1 Peter 3:21 refers to the same sort of baptism as the other passages cited, then clearly they speak of water baptism as well. The passage that would come closest to teaching a “Spirit” baptism would be 1 Corinthians 12:13, but, the fact is, a careful analysis of related passages reveals that not even this text teaches a baptism in the Spirit. Note the following logic: The baptism of 1 Corinthians 12:13 puts one into the one “body,” which is the same as the “church” (Eph. 1:22-23; Col. 1:18,24). But the church is identified with the kingdom of Christ (Mt. 16:18-19). Thus, the baptism of the text under consideration introduces one into the Lord’s kingdom. However, a related passage demonstrates that it is through the birth of “water” that one enters Christ’s kingdom (Jn. 3:3-5). One is forced to conclude, therefore, that the baptism of 1 Corinthians 12:13 is water baptism. Finally, there is a principle of interpretation that is paramount in sound Bible exegesis. Frequently it is the case that Bible words will form a pattern. That is, a consideration of several passages containing a term will reveal that the word has a commonly understood significance. Such being the case, that normal meaning is to be attached to the term unless an exceptional context suggests that it has taken on a special significance (i.e., a figurative sense). The term “baptize,” and its cognate “baptism,” occur together about 100 times in the New Testament. A consideration of these passages will reveal that the word may, on occasion, take on a figurative application (cf. Mt. 3:11; Lk. 12:50; Acts 1:5). Unless, though, there is clear contextual evidence that a symbolic sense has been employed, the conclusion must be that the common usage (an immersion in water) is in view. In view of this principle, there is no reason to conclude the baptism mentioned in Matthew 28:19; Mark 16:16; Acts 2:38, 22:16; Romans 6:3-4; 1 Corinthians 12:13; Galatians 3:27; Colossians 2:12, and 1 Peter 3:21 is anything other than water baptism — an act of obedience, predicated upon faith and repentance, which secures forgiveness of sins and brings one into union with Jesus Christ. To all of this we add this point. The clear cases of water baptism in the book of Acts (chapters 8 and 10) very obviously were not examples of Jewish ritualism. The indisputable fact is that the Mosaic law had been abolished by the cross (Eph. 2:15; Col. 2:14), and no Jewish rite was henceforth tolerated in connection with the salvation process (cf. Acts 15:1; Gal. 5:2-4).